Learn to create strikethrough shortcut key for MS Word, MS Excel, MS Outlook etc. Microsoft doesn’t provide any built-in key combination for the strike through command. MS Word provides a number of shortcut key combinations to make your office work faster. If you need to use MS Word a lot, it is highly recommended that you learn a few useful shortcut keys —it will help you work swiftly. You can press Ctrl+B to make text bold, Ctrl+U to make the text underlined. These shortcuts work in all the parts of Microsoft Office, like MS Excel, MS Outlook, MS PowerPoint etc. However, by default, MS Word does not provide shortcut for strikethrough command. Even though strikethrough is an often used command, it is surprising that Microsoft has not created a shortcut key for strikethrough. But the good thing is that we can customize MS Word to create such a shortcut key combination. Today I will teach you how to set a quick way to make the text strikethrough. You will need to do the following process just once and after that, you will be able to strike out text by pressing the chosen key combination. Open any MS Word document. You can open even a blank document as well. Press Ctrl+D to bring up the Font dialog box. This box shows you the font formatting options. Font dialog box in MS Word. Now press Ctrl+Alt and while holding both these keys down, press plus key on your Numeric Pad (Numpad). Your cursor will change to a clove shaped one. Release the Ctrl+Alt keys and click on the Strikethrough option in the Font dialog box (shown with the red circle in the above image). Customize Keyboard dialog box will open. Put your cursor in the Press new shortcut key box and press the shortcut key combination that you would like to set for strikethrough option. I have set it to Ctrl+Shift+S … You can also set it like that. Put the cursor in Press new shortcut key box and press Ctrl+Shift+S. 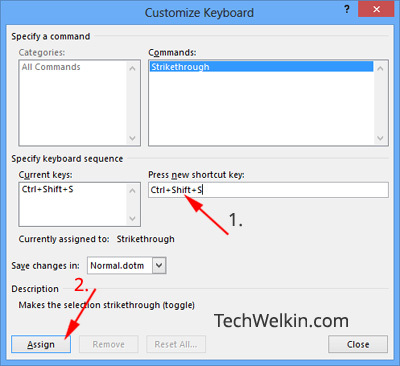 Customize Keyboard dialog box in MS Word for setting shortcut for strikethrough. MS Word will automatically capture the keys you will press. You can use any combination of Shift, Alt, Ctrl and a letter key. If you will press a key combination that has already been assigned to some other command, MS Word will show you this information. It is better not to overwrite any existing shortcut. Ctrl+Shift+ is a good combination. Click on Assign button to set the shortcut for strikethrough. Now to test whether it is working or not, type anything in the MS Word document. Select the text and press Ctrl+Shift+S (or the other combination that you’ve chosen). The selected text will immediately be strikethrough. 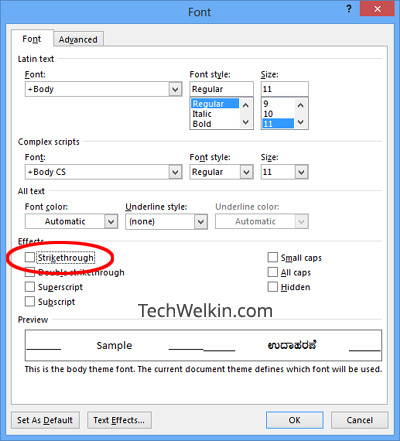 I hope you found this little tip on setting shortcut for strikethrough in MS Word useful. Should you have any question on this topic, please feel free to ask me through the comments section on this page. I will try my best to be of help to you. Thank you for using TechWelkin! Thanks a lot! Its so useful and handy. I thought setting up this MS Word strike-through shortcut might allow me to use the shortcut in Outlook, too, but it did not. Is there a way to set-up a strike-through shortcut in Outlook? I tried this and apparently did something wrong after the clove-shaped cursor came up. Now when I try it again, the clove doesn’t come up and I can’t create the shortcut. I tried closing Word and trying to create shortcut again, with no luck. Thanks for any help you might give – it adds time to manually do the strike-throughs as I edit long docs. REALLY useful and helpful, thank you very much. AWESOME! I was afraid I wouldn’t be able to get myself through it but you made it VERY do-able! Thanks!!! Thank you so much for the tip. I was struggling to find this shortcut. I’m sure it works fine on a full keyboard but don’t have a numerical pad on my laptop – any tips on how to do it in this setting? Thanks. You can see here how to use numeric pad on a laptop.